The entire saga is now on DVD: Through Image, the silent Dr. Mabuse the Gambler; from All Day, the prophetic 1,000 Eyes of Dr. Mabuse and now from Criterion the superlative The Testament of Dr. Mabuse with a wonderful group of extras. The modern world's greatest concern is the idea of 'terrorism,' a concept that might have been invented by Norbert Jacques and Fritz Lang in these amazing movies. "Who is behind these crimes?" is a cry we now hear every day, and for the answer in the inflation-ridden twenties in Germany, Lang posited the mystery man Mabuse, a master of diguises and hypnotism with fantastic plans to manipulate stock markets and economies. A rash of perfectly-executed crimes hits Berlin. The crafty Kriminalkomissar inspector Lohmann (Otto Wernicke) thinks that the sudden madness of an ex- policeman Hofmeister (Karl Meixner) is part of it. The clue "Mabuse" keeps coming up but the few who remember that master criminal know that he's been confined to a madhouse for ten years. In reality, Mabuse (Rudolf Klein-Rogge) is concocting what he calls an "empire of crime" from his asylum cell, on reams of scribbled paper. The asylum director Doctor Baum (Oscar Beregi Sr.) is carrying out Mabuse's orders by hypnotic command, leading his criminal organization by remote control. One of Mabuse's lieutenants is Thomas Kent (Gustav Diessl), an honest man driven to crime by unemployment. The love of his girlfriend Lilli (Wera Liessem) inspires Kent to defect from Mabuse's service even though that carries the underworld kiss of death from Mabuse's internal hit squad. The Testament of Dr. Mabuse looks like "M" with its colorful criminals and old-Berlin settings, but the pace and style are incredibly modern. The keynote to this world is instability. Our hero cries out for fairness at an unemployment office and the only work he finds is in a criminal syndicate. A great doctor and asylum governor is "demonically" possessed via hypnotism, acting not for himself but as the catspaw of another. Normal investigation fails to reveal the Mr. Big behind the conspiracies, no "man behind the curtain." Anyone who opposes Mabuse falls victim to a bureaucratized system of assassins. The setting of the opening scene is an "unstable" room shaking and rattling with a deafening roar that makes communication impossible. Locked in a room and bombarded with sensory overload - that's Lang's vision of modern man. Locked in another room is a twisted maniac equally incapable of communicating yet spewing forth a geyser of nefarious written plans. A double agent in his employ that tries to reach Inspector Lohmann (the gross but effective detective of "M") is driven insane so he can't testify. A concerned citizen stumbles on Mabuse's method of communication but is killed with a terrifyingly ingenious efficiency (a scene so good, Lang repeated it in 1,000 Eyes, to be copied again in The Ipcress File). The doubting hero also decides to defect and is immediately captured by a one-legged beggar with a concealed pistol. Lang mixes in fantastic visuals as wild as anything in Destiny or Metropolis. Hofmeister's delusions find expression in a jail cell that becomes a distortion of the room where he lost his mind, with a desk and other items all rendered in exaggerated glass. Dr. Baum's possession by the spirit of Mabuse is shown with a literal ghost-figure of the evil mastermind, who now has giant praying mantis eyes like Astaroth from The Golem and an eerily exposed brain too saturated with evil to stay in his head. Unlike plodding American serials, The Testament of Dr. Mabuse moves like a house on fire, using Lang's associative linkages to jump to new scenes without "finishing" previous ones. As in "M", the mention of a person or an object will immediately cut to that object, creating logical links that force us to follow the plot. Sometimes the the final clue will be a concept, like, "Something is definitely not right here," whereupon the screen cuts directly to Mabuse in his cell. James Bond's Ernst Stavro Blofeld has nothing on Mabuse. His terrorized minions have no idea who he is or what he looks like. Fat Lohmann is a wonderful cop hero, and there is great playing from a rogue's gallery of amusing crooks who talk crime while cooking sausages, or rave like fanatics when they're cornered. An apartment building is the site of a great shootout standoff that Alfred Hitchcock must have wanted to top in his The Man Who Knew Too Much the next year. Our hero is Gustav Diessel, who played a memorable Jack the Ripper in Pabst's Pandora's Box a few years before. He's a solid guy gone wrong who redeems himself by using his engineering skills to escape Mabuse's death trap. Is it a comment on the engineer hero played by Paul Muni in I Am a Fugitive from a Chain Gang? He's steered back to the side of the law by the love of a good woman, perhaps the weakest link (and performance) in the movie. Lang cleverly creates villains who behave like secretive Nazi thugs, and Mabuse's "empire of crime" sounds like a twist on Nazi ideology. In the end, although Mabuse is dead and his possessed henchman are under lock and key, we don't feel as if there's any sure finish to the madman's rule of terror ... some kind of evil has been unleashed on the world and cannot be bottled up again. 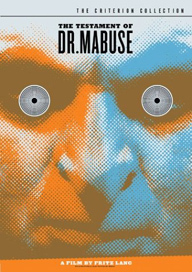 The Testament of Dr. Mabuse is an instance of a movie that can truly be called seminal. The first and best extra is a commentary by David Kalat, he-who-knowest when it comes to Mabuse in all of his incarnations. Those who were entertained by Kalat's commentaries on the previous Mabuse discs will be impressed with his ability to fill yet another movie track with fresh material. Again, he's an engaging host - with a speaking talent that Savant envies. The second disc is impressively packed even for a Criterion special edition. First up is the entire French version of the movie, shot simultaneously by Lang with many different (and mostly lesser) cast members. The quality of this is marginal, but we just want to see it for comparison. French audiences, for instance, weren't given images of an unemployment crisis. A lengthy excerpt from a 1964 German interview with Lang by Erwin Leiser comes next, followed by an interesting 1984 visit with Rudolf Schündler, an actor who played Testament's manic, supposedly homosexual hit-man. David Kalat returns with a comparison featurette that carefully charts differences between the German and French versions, and the 1952 American chop & dub job The Crimes of Dr. Mabuse. German Mabuse expert Michael Farin is the subject of a docu on the author Norbert Jacques. Curiously, one of the posters of Mabuse sequels flashed briefly in this featurette is one for Scream and Scream Again, which was retitled and sold in Germany as a Mabuse picture! There is also an interesting collection of production design drawings, stills and posters, some featuring some pretty weird graphics. Tom Gunning provides the concise and lucid liner essay. Susan Arosteguy is Criterion's producer for this wonderful movie experience. Supplements: Audio commentary by David Kalat, author of The Strange Case of Dr. Mabuse, Complete French-language version of the film, Le Testament du Dr. Mabuse, Excerpts from For Example Fritz Lang, 1964 interview with Lang Mabuse in Mind, 1984 film by Thomas Honickel featuring an interview with actor Rudolf Schundler, Comparison between the 1932 German version, the French version, and The Crimes of Dr. Mabuse the 1952 edited and dubbed American version of the film, Interview with German Mabuse expert Michael Farin about the literary inventor of the series, Norbert Jacques, Rare production design drawings by art director Emil Hasler, Collection of memorabilia, press books, stills, and posters, essay by Tom Gunning, author of The Films of Fritz Lang. 1. Savant saw the three Mabuse films all in one day of screenings at the LA Filmex festival in 1980, and it was a revelation. Lang's vision seemed to encompass the entire century's pulp concerns. Like the mad Mabuse in his asylum cell, I sat and scribbled on a piece of foolscap a schemata of themes that ran through serial thrillers, serials, horror films, science fiction films, espionage films, superspy films, conspiracy films and political thrillers: hypnotism, blackmail, crime, amnesia, delusions of grandeur, the remote control of human beings, artificial life, high technology, robots, death rays, secret societies, anarchistic conspiracies and the end of the world. And every theme was threaded through the spy, crime and fantastic films of Fritz Lang like a seam of gold. 2. This 1.19 ratio sure proves that my rear-projection Mitsubishi television overscans severely - I can only see the frame line of the narrow image a little bit, and only on the right side! When sound came in, film technicians had to find a place to put the soundtrack, as the "Silent" aperture reached to the perforations on each side of the film strip, and the top of the frame was just a narrow line. In the American "Movietone" format the left side of the frame lost a stripe for the sound track, making the picture much more narrow. Movies from 1929 - 1930 often have heads cut off on TV, because later copies were made blowing this narrow frame up larger. The solution was to make the frame line fatter, restoring the 1:37 "Academy" aperture. It wastes more picture area but at least doesn't look so narrow. Modern "scope" photography uses the "Movietone" aperture, because the picture is spread out anyway later during projection. Super-35 photography uses the entire "Silent" aperture, meaning that the image has to be repositioned and squeezed later. Special effects cameramen always try to use the largest film area possible to reduce grain during optical duping; according to effects man Jim Danforth, the effects shots of Jack the Giant Killer were shot this way. He says that that wasn't taken into account when the new DVD was made, and the DVD cuts off the left and crops in as if the photography was "Academy." Follow any of this?